I have wanted to read this book ever since I heard about it. I love P. D. James' books. I love Jane Austen's books. Therefore a P. D. James written sequel to Pride and Prejudice must be right up my alley! As an aside, it seems as though Pride and Prejudice spin-offs have become an industry of their own. I was in a bookstore in Minneapolis with a friend back in December, and we lost count of the P&P sequels, fan fiction, and other various and assorted spin-offs. Other than an unfortunate encounter with P&P&Zombies, this is my first experience with this quickly expanding genre. I suspect that the popularity of the movie versions may have something to do with this trend (I myself am a fan of the 1995 BBC version, but not so much the more recent one with Kiera Knightly). It was a pretty easy read, but I came away from it with mixed feelings. Parts of it really felt like they were written by Jane Austen herself, with her distinctive voice and sense of humour. But parts of it read very much like a P. D. James mystery. The overall effect was very much a patchwork of the two styles - I never knew what to expect at the start of each chapter (or even each paragraph at times). The mystery itself, and the solution were a bit predictable. I had guessed most of the ending by part way through the book. But isn't that the fun of a mystery - trying to guess the end, and seeing if you are right? It was fun visiting with all of the characters from Pride and Prejudice again, and meeting some new characters. I thought that P. D. James stayed very true to the original characters. And it was fun spotting characters from other Austen novels. Mr. and Mrs. Knightly make a cameo appearance, as does the friend of Mrs. Knightly (née Emma Woodhouse), Mrs. Martin (née Harriet Smith). And James has Mr. Wickham working for a time as the secretary to Sir Walter Elliot, meeting up with his daughters. So an in-between review of this one. If you are a Jane Austen fan, you will either enjoy the time spent with old friends; or you will be horrified at the liberties taken with the original. If you are not familiar with the original story of Pride and Prejudice, but are a fan of P. D. James or gentle mysteries, you will probably enjoy this one. But if you don't know Pride and Prejudice and aren't a mystery fan, you probably won't turn to this book anyways! This review is very heartening. I like both writers, but wasn't sure how they'd mix--I like onions and chocolate, but not together :)I think I'll try this now! And oh, sighhhhh, the Beeb P&P. Haven't seen any other versions because I don't want to spoil my images of Darcy and Lizzie from this one. Niranjana - The mixing was a little bit rough along the edges, but overall I did enjoy this book. 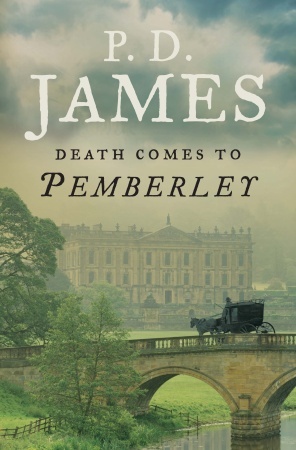 If you like both authors, give it a try and as I said, you will either enjoy the time you spend at Pemberley, or you will be angry that P. D. James DARED to take the liberties that she did!